Masia Olivera ist eine Anlage, die vollständig in die Landschaft des Penedes integriert ist, umgeben von Weinbergen. Es besteht aus mehreren, völlig unabhängigen Häusern, und Gärten, und einem Außenbereich, der ideal für junge Leute ist. m2, exklusiv für die Gäste der beiden Häuser. restauriert und ist heute eine gemütliche und rustikale Wohnung. Son varias casas dentro de la misma. Todas en perfecto estado y acondicionadas para que no necesites nada más que disfrutar de la compañía y el paisaje. Raimon, gracias por todo, a mi familia les gusto mucho el sitio y estuvimos muy cómodos. Nos volveremos a ver! In the summer of 2012 we have discovered the Catalan countryside. 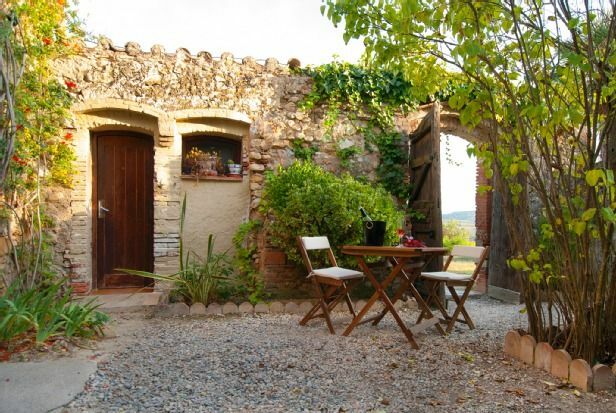 Via toprural we arrived on an ancient Catalan farmhouse, converted into different apartments, in the middle of old vinyards. What struck us most, was the warm welcome and inviting kindness of our host Raimon Olivella. He made it an unforgettable experience, enlightening the Catalan culture and helping us find rare and beautiful places to visit. In just one week we learned to wine and dine the Catalan way and enjoy ourselves in locations remote from everyday tourism. For this we are indebted to our host who showed us the way, but kept a respectful distance, being a guide and not an intruder. A great thank you to him and to all the people we met! Todo fue muy bien con Raimon y su finca, y especialmente para los ninos es un lugar perfecto. Campo de futbol, piscina grande, mucho espacio, etc. Entorno muy bonito!